Quote Roller Never Sleeps: More New Features! It may have only been two weeks since our Big Huge Spring Update, but we’ve been staying up late to make sure we keep rolling out more features to make your proposal process more efficient! This update includes Price Lists, Expiration Dates, Catalog Cleanup, a new integration with Basecamp as well as tons of tiny tweaks and ample improvements. Dive right in for more info under the cut! You’ve all asked for it and now it’s here! Pricing lists are templates for pricing tables, so you can reuse the same pricing table when you create new proposals with putting in more effort. When you think about it, most of the time, you are using the same or similar proposals, pricing tables, copy, images, etc. (Remember you can manage all that and more by using our Content Library.) Now you can fully automate your proposal creation: from templates and content blocks to to pricing tables. Now, the question is, what are you going to do with all that new free time? 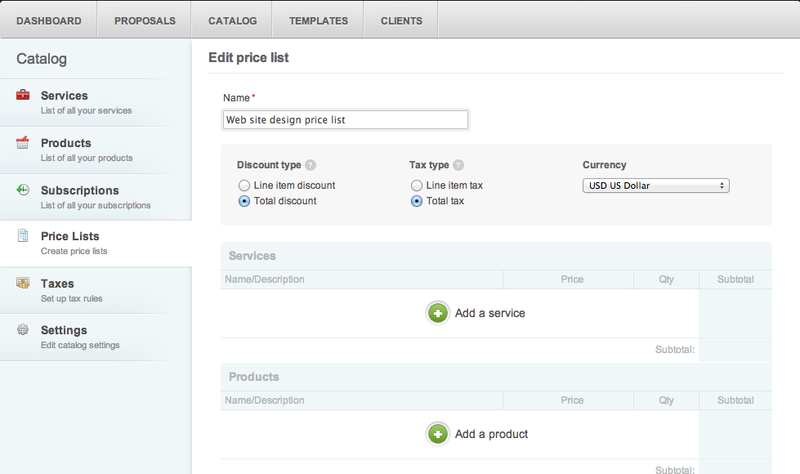 You can select the appropriate pricing list right in the pricing table block in any template. When you create a proposal based on this template, the selected price list will load automatically. One more highly requested feature! Now you can make sure your clients don’t hem and haw for too long by setting an expiration date for proposals during Step 5 of the wizard. When a proposal is expired, it will be marked as expired in Quote Roller and clients won’t be able to access the document. They will surely then feel the pain of having missed out! Now you can clean up your products as well as categories! Great when you import many products and then want to change something. Again, we have tested the feature more than hundred times and it works just wonderfully. Reminder, the changes you make are irreversible! We have changed how the proposal preview mode works. Now you see it exactly how your client will see it. We have also removed the preview PDF panel, as it was confusing for many and required to have the PDF plugin installed. Now you can download PDF the same way as your clients. Previously, archived proposals were available for your clients for reference. But our users were asking for a way to make proposals unavailable and archive them completely. Since now on, Archived status of a proposal means that it is not available to your clients anymore. When you customer visits the archived proposal, they will be greeted with a message to contact the author of the proposal. With our newest integration, you can convert proposals to projects with awesome project and team management tool Basecamp! Clients will be added to the projects as well. Unfortunately we cannot implement contact sync at this moment because new Basecamp does not support Companies via API. What do you think about the new features? What should we do next?